Last night in the War Memorial Opera House, the San Francisco Opera (SFO) presented the first of six performances of its second offering for its 2017–2018 season. 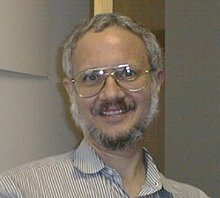 The production was Keith Warner’s staging of Richard Strauss’ one-act opera “Elektra,” which SFO shared with the National Theatre in Prague and the Badisches Staatstheater in Karlsruhe. The stage director here in San Francisco was Anja Kühnhold, who provided useful background information about Warner’s vision at the Insight Panel held this past Thursday evening. This opera, first performed in Dresden in 1909, marked the beginning of a long a fruitful relationship that Strauss had working with Hugo von Hofmannsthal as his librettist. In this case Hofmannsthal simply adapted the play of the same title, which he had written in 1903, drawing primarily on Sophocles’ drama as his source. While the Greek plays tended to be relatively compact, Strauss requested some substantial cuts in Hofmannsthal’s original script. Strauss’ suggestions were good ones; and the result was one of his most compact compositions, whose intensity tapped into primordially visceral characteristics of not just early Greek tragedy but its bardic predecessors. Nevertheless, there are traditional cuts taken when the opera is performed; and those cuts were imposed last night. One problem with presenting any account of Sophocles’ play is that it takes place in the middle of a much longer story. The overall tragedy of the House of Atreus is a blood-soaked tale of vengeance in which murder is avenged by murder over several generations. In Aeschylus’ version of the story, the cycle only ends after the Gods intervene; and that intervention basically amounts to the invention of jurisprudence by Apollo and Athena. 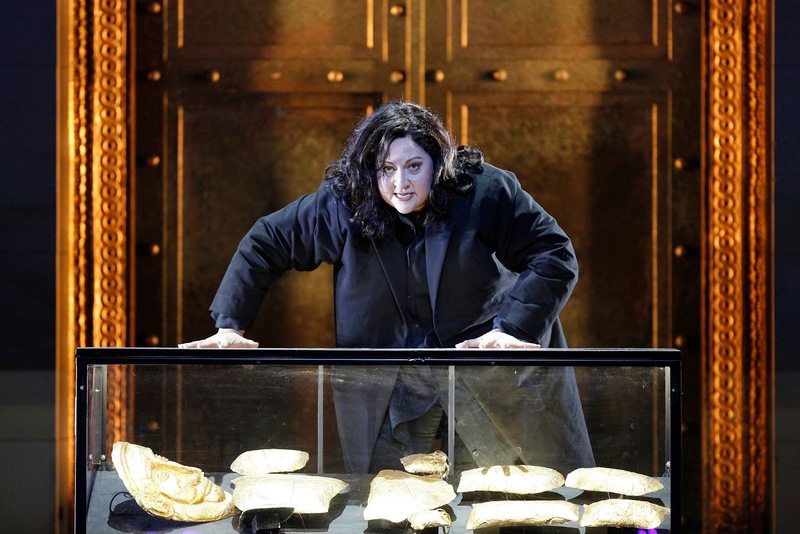 Strauss’ opera deals with the murder of Klytemnestra and her lover Aegisth at the hands of her daughter and son, Elektra and Orest, to avenge the murder of their father Agamemnon. We are thus introduced to a visitor confronted with both artifacts and video images, who becomes absorbed into the Atreus saga and emerges as Elektra herself. 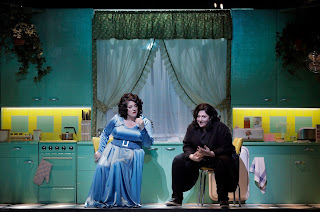 That transition is facilitated by the opera libretto, since the opening section involves a somewhat chaotic exchanges of questions and answers among five maidservants. In Warner’s context this establishes the necessary background for the plot that will then unfold. This introduction is followed by Elektra’s first major aria, “Allein! Weh, ganz allein” (alone, alas, all alone), which basically establishes the visitor’s transformation. She hid herself in the museum at closing time, and is now alone there. This parallels Elektra’s isolation from both her family and the people of Argos. Her only “connections” are to her murdered father and her brother who is presumed dead. With that transformation established as a point of departure, the scenario proceeds through a series of stages in which Elektra confronts first her younger and weaker sister Chrysothemis, then Klytemnestra herself, and finally Orest, come out of hiding and very much alive. There follows his killing of by Klytemnestra and Aegisth, followed by Elektra’s first moments of joy, expressed through ecstatic dancing. However, while vengeance has been fulfilled, she is, once again, alone. The orchestral resources for this opera required 95 players, some of whom had to be located in the “torpedo room” behind the orchestra pit. These are, in fact, the most crowded conditions for the musicians in SFO history. On the stage, while there are only a few principal characters, there are any number of “observers” (such as the maidservants), who emerge as reincarnations of the museum visitors. The result is an overall sense of dynamic flow between past and present, which is reinforced through several imaginative set designs by Boris Kudlička (making his SFO debut). The most striking of those involved having Elektra’s confrontation with Klytemnestra take place in a Fifties-vintage suburban kitchen. It is through gestures like these that the audience is reminded that Elektra exists only in the mind of that museum visitor encountered before the first note of music has sounded. That visitor was sung by soprano Christine Goerke with an impressively authoritative command of all the challenges Strauss set out in his score. Through her ability to capture the two sides of her role conceived by Warner, we could appreciate how all of the other roles had more to do with the visitor’s impression of those characters, rather than the characters themselves. This is most evident in Chrysothemis (soprano Andrianne Pieczonka), who just wants to “get over it” rather than follow Elektra down the path to vengeance. 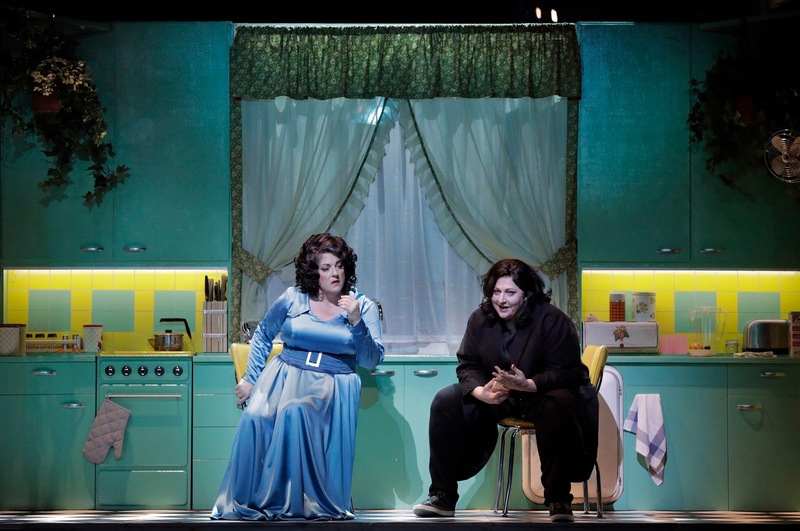 Kudlička’s kitchen set reminds us that, whatever the circumstances, the interaction between Elektra and Klytemnestra (soprano Michaela Martens) is just another take on daughter-mother relationships. Orest (bass-baritone Alfred Walker), on the other hand, emerges as the instrument of that vengeance, focused more on the act itself than on the individuals involved. All of these reflections unfold against Henrik Nánási’s conducting of Strauss’ score. Nánási was also making his first appearance with SFO, but that appearance was a confident one. He knew how to get the ensemble to respond to the dramatic intensity on stage with their own musical intensity, but he also knew how to avoid wallowing in excess. The orchestra pit thus become the “engine room” that powered the unfolding of the narrative at its proper pace. One may not have been able to attend to every last detail of instrumental activity, but Nánási provided just the right techniques through which that activity reinforced the persistent advance of the plot all the way to Elektra’s final confrontation to that solitude that is still with her.